Life has felt a little bit busy lately. I’ve been trying to post three recipes a week and I was having a good run until last week rolled around and I fell behind. We went to Arezzo to visit hubby’s parents last weekend and spending the weekend away always throws me off during the week ahead. I spent last week trying to catch up on errands and chores I would have normally done on the weekend, work was busier than usual and I ran into some technical difficulties, which means I didn’t even manage to get one blog post up, let alone three. I flashed this bowl on Instagram a couple of weeks ago. It was my quick homemade lunch one day and I managed to snap a couple of pictures on my camera. They weren’t intended for a post in that I was just “playing” with my camera, and had planned to re-shoot this recipe “properly” when I had more time, but since time is not on my side these days, the shots are decent enough to share and the recipe is a winner, I’ve decided to post it for you today. 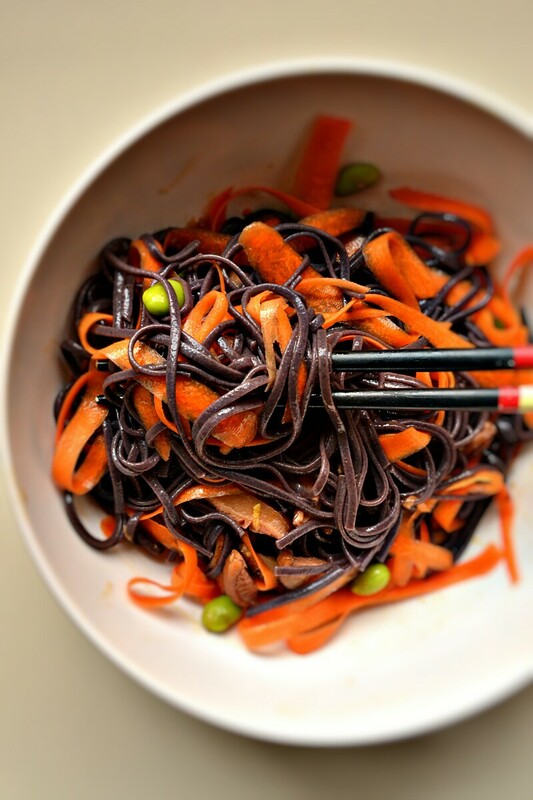 It’s so simple and if you can’t find black rice noodles for whatever reason, feel free to use soba noodles, brown rice noodles or any other noodle of choice. I’ve used dried shiitake mushrooms and frozen edamame beans because I can’t seem to find fresh Organic ones in Milan (I’m probably not looking hard enough), but you can go ahead and use the fresh ones if you have those on hand, preferably organic. Just be sure to steam the fresh edamame first. 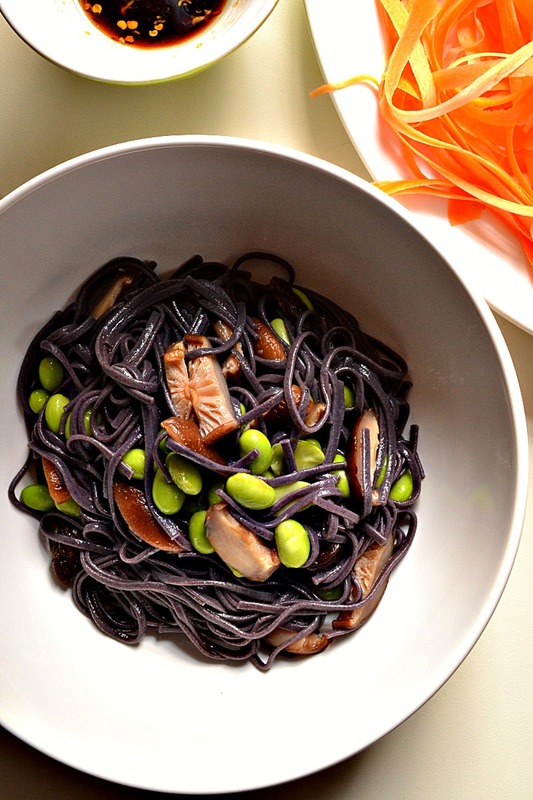 Black rice noodles are the hero in this dish. As the name says they’re made of black rice which is naturally gluten free. I wrote all about black rice in one of my earliest posts, so if you’re curious about the origins and history, check it out here. These noodles are made from 56% organic black rice, organic brown rice and water. No other additives or ingredients. Simple and clean. 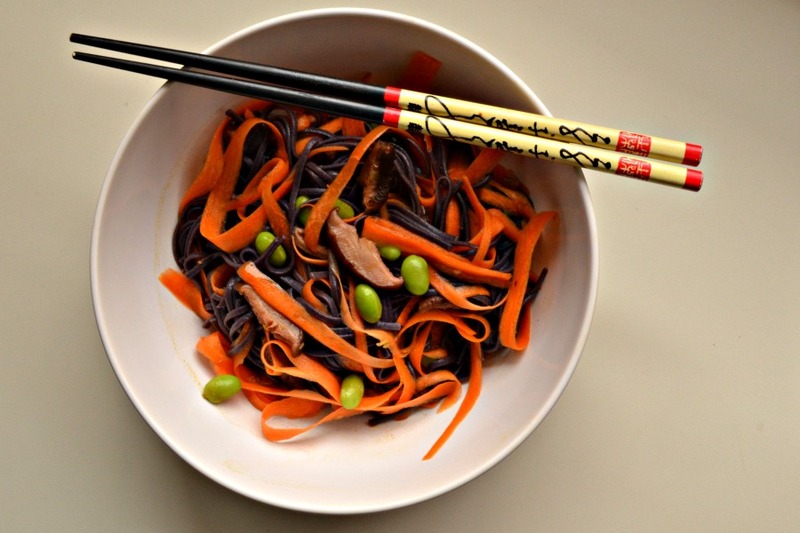 The black rice gives the noodles a deep purple colour and a nutty flavour that’s rich in vitamins, minerals and fiber. They also happen to be a good source of plant based protein, 7g per 100 g of noodles. 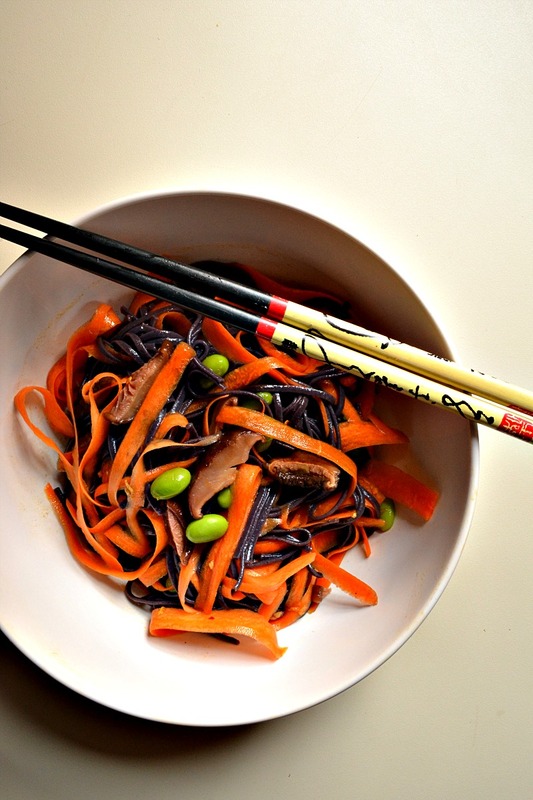 Combining them with edamame and shiitake in this dish helps make a complete protein. If you are allergic to or avoid soy products, you can use chickpeas or green peas instead. Shiitake mushrooms are a symbol of longevity in Asian cultures, have potent healing properties and have been used medicinally for thousands of years. They are known to be immune boosting and to be an excellent source of plant based iron. Shiitake mushrooms are also an excellent source of many vitamins and minerals including B complex vitamins, selenium and copper and a good source of folate, zinc, and vitamin D2. They are also a good source of dietary fiber. Soak the shiitake mushrooms in hot water for about 15 minutes. Strain the mushrooms, reserving the water, remove the tough stems and slice in half or quarters. Add 1-2 tablespoons of the reserved mushroom water to a warm wok over medium heat. As soon as it starts to steam, add mushrooms and sautée for about 5-7 minutes. Transfer to plate and let cool. Next, bring a pot of water to boil and cook the noodles according to package directions. The brand I use takes about 4-5 minutes to cook al dente, which means soft but firm, you don’t want them mushy. Add the frozen edamame to the noodles in the last 3 minutes of cooking, to blanch them. If you are using fresh edamame beans, you’ll want to steam them and shell them before adding them to the salad. Strain and rinse the noodles and edamame beans in cold water (preferably filtered) to stop the cooking process, transfer to a salad bowl, top with sliced shiitake and set aside. Meanwhile, prepare the carrot ribbons. Wash and scrub the carrots really well with a vegetable brush. If the carrots are organic, you can eat the skin, but I recommend you peel them if they are not organic. Using a vegetable peeler, make thick tagliatelle style ribbons. If you have a spiralizer and prefer to use that, it will do just fine, but I prefer the thicker tagliatelle style ribbons. Add them to the salad bowl with the rest of the salad ingredients. Whisk together the dressing ingredients in a small bowl and pour as much as you like over the noodles and vegetables. Toss with chopsticks or tongs until well combined. Sprinkle with toasted sesame seeds, if desired and serve at room temperature. This is how to flavor #Vegan Rice Noodle Salad #Recipe You don’t need to saute in oil for flavor. Nice and the colors make me nostalgic and I remember the days I spent in the farm on the countryside….